This post is long overdue, but my excuse is that this summer became defined by a cross country move: we've relocated from Colorado Springs, CO to Merrimack, NH! Moving across country is no easy task and it was a bit stressful and exhausting at times. But we made it. We're in a nice town, convenient for commuting, good schools, and a small community atmosphere. We live 45 minutes from my parents and 30 minutes from Billerica, where we'd previously spent 7 years living before we moved to Colorado. We feel pretty fortunate to be able to return to our favorite part of the country. Leaving New England wasn't easy to begin with - but we were hopeful and determined to make Colorado our home. It was 4.5 years of lots of highs and lows. We bought a five bedroom house with a yard and a garage and our mortgage was the identical amount to the two bedroom townhouse we'd been renting in Billerica. I enjoyed the sunny weather, mild winters, being close(ish) to my sister, the community I found in a MOPs group and within the FRMQG. My mom visited often. But there were many struggles. Oddly enough, in a town known for being deeply "military"- we we were in a community surrounded by native Coloradoan's and we felt like outsiders. We opened our home to other families constantly and it was almost never reciprocated. "School choice" afforded my children better educational opportunities but it also resulted in too much time in the car and further isolation from other families. Colorado Springs just made me feel so "anonymous." It's a word that may not perfectly explain the feeling of isolation and lack of community I had while living there. I've never been one to be too fearful about living away from where I've grown up- I went off to Utah for college, traveled the world during my education, and went to South Carolina on a whim for graduate school where I didn't know a soul. But life is a lot different when you're raising a family and feel like you have very minimal support outside of your immediate family. I am not so naive that I think coming back to New England will solve all of our problems. There are challenges here too. I am living in a part of New Hampshire that is new to me and I am trying to figure things out. Despite the air of familiarity here, I still feel like I am starting over and it's downright exhausting to be the new girl again. I've done a little bit of sewing since flying out here on July 31st, but overall it's not been happening at all. I have a new sewing room that still needs setting up. I've been waiting for a few weeks now, to receive an order of stand alone cabinets that will substitute as a closet to hold my (ample) sewing supplies. 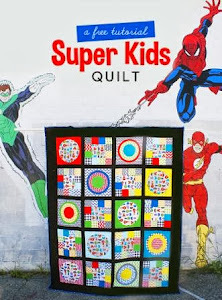 This quilt spent a full month on the longarm, I really struggled with quilting it well and not being too frustrated with my sub-par free motion quilting skills. But I know I need to give myself some credit, I've come a long way from my "stippling" habit that dominated my FMQ style years ago. I can easily say that this quilt is one of the most challenging quilts I've ever completed. It was tedious to do blocks twice- especially those dang ones with curves! I messed up the "mirror image" concept of several of the blocks many times. When the quilt top was all put together, I ended up taking out 3 different large blocks to switch out a bad fabric choice and re-orient one that was upside down. Do you know how challenging that is- to have something be technically "done"- but take a seam ripper to it and take out chunks of it, re-sew them, and put it all back together?! I can't believe I did that three times! And quilting it was just a bear. There were times when I'd go to the longarm in the basement and I'd just come right back upstairs and do something else because I was too discouraged to even try. 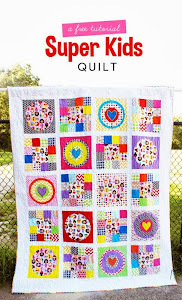 I really think that I if I could've afforded to, I would've loved to been able to pay someone else to quilt it for me. Haha! But I really love it now that it's done. Thanks for reading this lengthy post! I do love this space and the chance to write and record my creative and sometimes personal journey. All summer, I received emails from Bloglovin that I had new followers even when I wasn't posting much at all. I hope to share more soon and provide more insight than the snapshots on Instagram provides.